Community, the union, has launched a major national campaign seeking vital government support for the UK steel industry at this week's Opposition Day parliamentary debate on foundation industries. This time last year, Tata Steel, the Indian-owned steelmaker with significant operations in Rotherham, set out the importance of foundation Industries to the UK economy and called on the Government to help them capitalise on the economy's return to growth. In a report commissioned by Tata Steel, PricewaterhouseCoopers (PwC) challenged many existing perceptions about foundation industries to emphasise the role they play in driving innovation and skills, as well as providing nearly half a million jobs and supporting millions of others. It classifies the foundation industries as those which supply materials to multiple, strategic manufacturing and construction supply chains, such as steel producers, chemical companies and other mineral producers. The debate comes about after intense campaigning activity by Community to put the concerns of steelworkers at the forefront of political debate. In recent months Community has met with Secretary of State for Business Vince Cable MP, had detailed discussions with Labour's Shadow business and energy teams, worked closely with MPs representing steel areas to support them in parliamentary debates, made joint representations to MPs and ministers with steel employers and liaised closely with relevant civil servants. Opposition Day sees the opposition party set the agenda for debate in the House of Commons. John Healey, local MP for Wentworth and Dearne, used the debate to say: "After nearly five years of failing economic policies, Britain badly needs a successful steel industry, not only in its own right but as a foundation industry for the success of this country's many other advanced manufacturing sectors, including the aerospace, automotive, oil and gas and renewables industries. "The steel industry and our UK companies together are positive contributors in that disastrous trade balance, involving £5 billion a year of exports. In 2013, the steel industry made a positive trade contribution of £2.4 billion. Tata's speciality steels manufacturing, which is largely based in South Yorkshire, now employs 2,250 people, 1,050 of whom are at the Rotherham site. 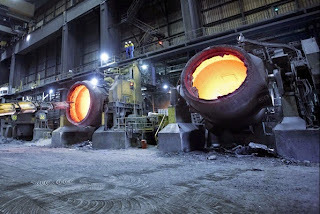 "That steel-making in South Yorkshire is innovative, internationally competitive and successful — 27% of the sales are to the UK market, with 18% going to the US and fully half to other eurozone countries—but it is under great pressure. It is hampered by high energy costs and held back by the Government not doing all they can to back this great British industry. "We have been making steel in Rotherham since the early 1800s, and Tata's steel-making, re-melting and mill processing now supplies some of the world's highest-quality, highest-performance metals to some of the world's biggest and best known companies. "We have come close to losing our Aldwarke plant before, and it was only because of the trade unions, working alongside the management — led by Stuart Sansome of Community union, alongside Mark Broxholme of what was then Corus Engineering Steels — that in 2009-09 we brought that company through that period. I pay tribute to them, and I was glad to hear the Business Secretary paying proper tribute to the trade unions role in the steel industry. "This is an internationally competitive but internationally exposed industry, clearly suffering the effects of weak eurozone demand, exchange rate changes and, above all, as a high-intensive energy user, very high comparative energy costs." Energy costs remain a significant element of the costs of the foundation industries with evidence that they are higher than those facing competitors operating in other countries. Rotherham MP, Sarah Champion used the debate to highlight the planned relocation of Tata's Rotherham R&D operation to Warwick which she described as a "lose-lose situation," adding: "It is not right that such a concentration of highly skilled workers is lost, particularly, as the Secretary of State said, as the advanced manufacturing centre’s catapult scheme and the steel proving factory are both in Rotherham." Following calls from Karl Koehler, CEO of Tata Steel's European operations, Community's "Stand up for Steel" campaign describes 2015 as "a critical year for the industry" and calls for the compensation package to be brought forward for energy intensive industries to help the industry become competitive; the use of government procurement to deliver for UK foundation industries; standing up for the UK steel industry in Europe and across the world; and the encouragment of employers to work with trade unions to create a sustainable future for UK steelmaking. Roy Rickhuss, general secretary of Community, said: "Along with steel employers, we have been making the case for some time to government that the UK steel industry needs more than warm words from ministers to overcome the challenges that the industry currently faces. "The government has missed too many opportunities to address the concerns of our members and their employers who are worried for the future of UK steel as they try to compete in a global market against countries, such as France and Germany, which provide far more support to their foundation industries."